It's April, so here comes the April Giveaway from my blog. All for one lucky winner! 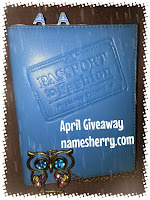 You need to be April Top Commentator to win this giveaway. It means that by end of this month the commentator with most comments win this giveaway. Giveaway open to my blog follower with address in Malaysia for postage. My blog follower of GFC or bloglovin or subscribed to my blog by email address. Giveaway ends on 30 April 2014 midnight, Malaysia time. yes, be top commentator for April. Yes Nicole now you gained 12 plus yesterday past midnight comments. 11 comments now. Is there a top commentator contest in My Mom's Best's blog too Sherry?? Or is it just here?? Oooh. I am excited! Awesome giveaway with attractive prize! Good luck to all. I hope I can win this time because the necklace is really cute! good luck, try comment as often as you can.